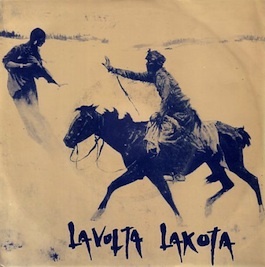 Lavolta Lakota were formed in 1982 by ex-STOCKHOLM MONSTER Ged Duffy (bass), Davyth Hicks (vocals/guitar) and Michael Eastwood (bass). The two bass player approach was a powerful innovation: seeing Duffy take the lead bass role and Eastwood pinning down the lower frequencies, with Hicks as the chief axe grinder - musically and lyrically. Drummer Guy Ainsworth was invited to make up the quartet, chosen ahead of the then drummers of fellow Manchester bands THE SMITHS and JAMES. Despite supporting THE SMITHS, CABARET VOLTAIRE, GUN CLUB and NEW ORDER; touring with THE FALL and DEATH CULT; being supported by THE STONE ROSES and appearing at Futurama and countless free festivals, only one recording was ever released: the 1984 double-A side 7" single Mitawin b/w Prayer (FBN 34) recorded at Strawberry Studios by their adopted live engineer Peter Hook (New Order). "At the time Factory seemed more interested in pop by toffs than rock by oiks, so we were directed, instead, to the more diverse and obliging Benelux" says Eastwood. "It may not have been lucrative, but at least it was enough for us all to be issued with Haçienda Honorary Memberships!" On completing a successful tour with Play Dead and with further recording planned, Duffy and Ainsworth inexplicably left the band. The remaining half-band fulfilled their immediate live commitments with an impromptu line-up that included Billy Duffy (The Cult) and Shan Hira (Stockholm Monsters). A new guitarist, Ashley Major, and drummer, Mike Simkins, reinvigorated the band resulting in Lavolta. However, despite intensive gigging - famously upstaging The Cult at the Manchester Poly in 1985 - further recording and a growing repertoire of material, a lack of effective management and an inability to compromise resulted in the band going their separate ways in 1986. Eastwood would go on to work as programmer/technician for ACR, HAPPY MONDAYS, NEW ORDER and ELECTRONIC, and Davyth Hicks would later form REVENGE - with Peter Hook and Chris Jones - and Rawhead. Looking back Hicks says: "Lavolta developed really well, we did loads of gigs and we all developed as musicians and performers. We were beginning to find our niche and had a growing fan base - it would've been good to have kept it going." 'The Earth has been abused, she will retaliate. That's revolution! '.